A novel kind of plywood is poised to revolutionize the construction industry. They just don't make 'em like the Sakyamuni Pagoda anymore. 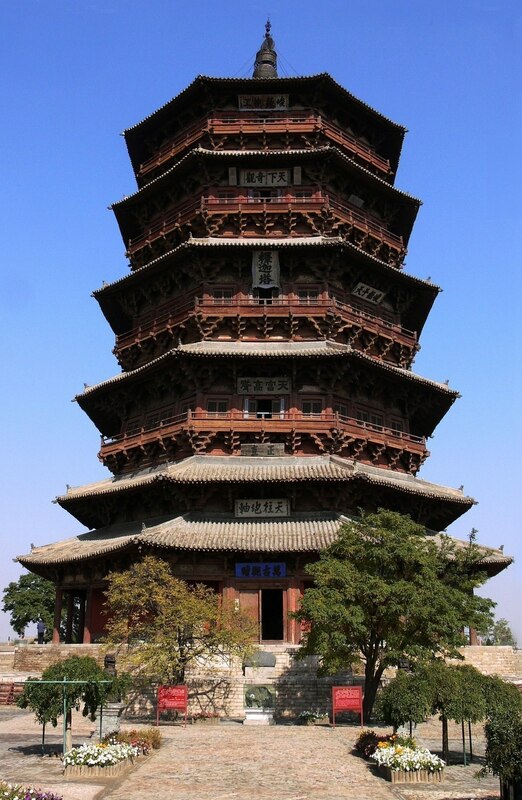 Built from wood in 1056 in the Shanxi province of China, the building has remained standing to this day, despite seven earthquakes rattling the region within its first 50 years of existence. Since then, it's held up against a slew of seismic events, even when more-modern structures have failed. Now, thanks to recent advancements in timber technology, modern architects are rediscovering the benefits of working with wood. Wood was the go-to construction material from the dawn of time up until the late 19th century. However, it is far from ideal. For one thing, its cells can swell and shrink by up to 10 percent of their original size, depending on the humidity. Plus, if it stays wet for too long, the material rots. Imperfections in the grain weaken its structural integrity and can cause it to fail under loads that it should otherwise support. In its natural state, wood breaks more easily than steel and bends more readily than concrete. Wood's biggest drawback is, of course, the fact that it burns so readily. That's not what you want in a densely packed urban center, as the fires of San Francisco in 1851 and 1906, Chicago in 1871, and Boston in 1872 illustrate. Still, while the 20th-century skylines were dominated by steel and concrete, the first two decades of the 21st have seen a rapid influx of wooden architectural designs. However, many are still little more than artist renderings. In 2012, the 10-story Forte residential block in Melbourne, Australia, became the world's tallest timber building. It was quickly overtaken two years (and four stories) later when The Treet in Central Bergen, Norway, was completed. The Brock Commons, in Canada, currently serves as 18 levels of student housing for the University of British Columbia. And by the end of this year, architects in Portland, Oregon, will break ground on a 12-story mixed-use structure dubbed the Framework, which will be the tallest wooden building in the US once it's complete. It should be complete by 2019. That structure may not hold the title for long, however, as the Cambridge University Department of Architecture is looking at how it might construct twin 80-story residential towers -- one on the Chicago River, the other in London. This rapid proliferation of designs is all thanks to a kind of building material called cross-laminated timber (CLT), which was invented in Europe in the 1990s. It's not that different from plywood, actually, just produced on a much larger scale. Long planks of two-by-fours are glued together side by side into sheets. Those sheets are then stacked three or four layers high, separated by fire-resistant glue and pressed together. By rotating the grain of each subsequent layer by 90 degrees, the composite material shows a structural strength that rivals steel and negates the imperfections that any one layer might have. Wood structures offer a number of benefits over steel and concrete, especially in an increasingly carbon-conscious world. For example, it's roughly a quarter of the weight of an equally sized concrete structure, which means that the foundations don't have to be as large. That means you don't need to use as many building materials and don't have to expend as much fuel getting them to the construction site, which further reduces carbon emissions. That's a big deal here in the States: According to the Department of Energy, a full 40 percent of the country's total carbon emissions come from building construction and use. "Carbon dioxide is the building block of wood," Professor Arijit Sinha of Oregon State University told Engadget. "As the tree grows, more carbon dioxide is stored." What's more, Sinha continued, lighter wooden buildings -- whether they're made from mass timber materials or traditional wood -- tend to withstand earthquakes better and dissipate the energy of the shaking more readily than steel structures. 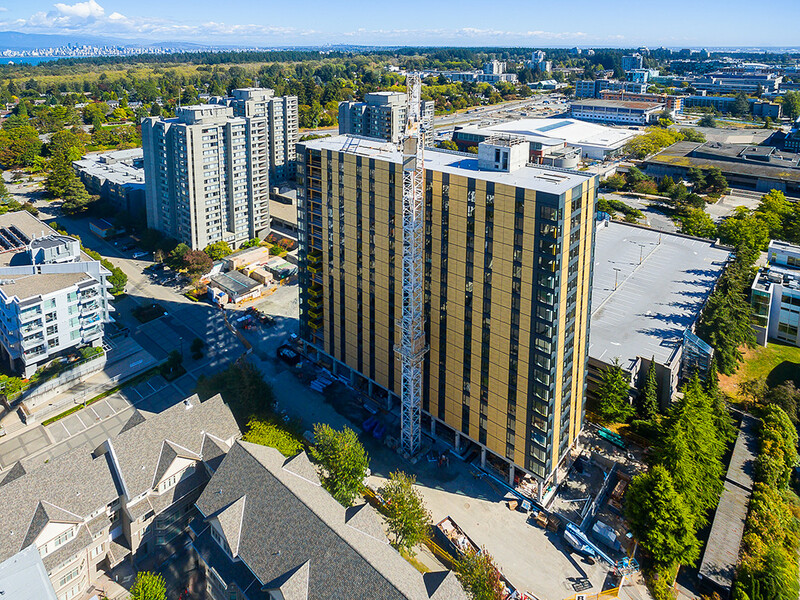 According to a 2014 study published in the Journal of Sustainable Forestry, we'd be able to reduce global C02 emissions by 15 to 20 percent if we used CLT instead of steel. Additionally, CLT can be fabricated in a factory and flat-packed Ikea-style to the job site and then simply assembled, rather than constructed in the traditional sense. "This has huge time and financial savings implications," Kevin Flanagan, a partner at PLP Architecture, told CNN. But perhaps wood's most valuable advantage is its ability to sequester carbon. A 2009 study by the University of Canterbury, in New Zealand, found that over a 60-year life cycle, "Increasing the amount of timber in the buildings decreased the initial embodied energy and GWP [Global Warming Potential] of materials and also decreased the total energy consumption and GWP." Overall, wooden buildings can have a total carbon footprint a third smaller than similarly sized steel and concrete buildings. "When you compare a wood building with a concrete building, wood wins every time," Jim Bowyer, an emeritus engineer at the University of Minnesota, in St. Paul, told Nature in May. But as promising as all of this carbon offsetting appears, whether that carbon remains locked depends largely on how the material is recycled. Unlike the Sakyamuni Pagoda, most modern buildings aren't meant to be everlasting. Instead they're routinely demolished and rebuilt every half a century or so as the needs of the city around them change. So what do you do with the pile of lumber after you've knocked down the structure? You can't dump it in a landfill and let it rot, as that slowly releases the trapped carbon back into the atmosphere, Sinha explained. Burning the wood for energy does the same thing, only more quickly. Responsibly recycling that wood for use in other construction projects or other products entirely is the only way to ensure that the sequestered carbon stays that way. Another major challenge is wood's sustainability. According to the World Wildlife Foundation, 58,000 square miles of forest are destroyed annually. That's roughly the land mass of Georgia. However, with responsible land management, a number of experts believe that we can make it work. "Wood is a renewable and sustainable resource so long as the forest is managed using good practices," Sinha said. "If that is happening, then wood is an obvious choice for building 'green.'" Bowyer, who is leading an expert assessment on behalf of the American Wood Council, figures that the US timber industry is currently logging about a third of the country's annual forest growth but has the capacity to double the amount of carbon sequestered in buildings annually. What's more, his team found that wood construction could expand beyond residential (some 80 percent of American homes are made from wood) into commercial and industrial spaces, without reducing the amount of carbon locked away in America's forests. Researchers are already looking to "mix the the [wood] species and glue type and play around with the orientation of the laminate to optimize the engineering properties for the specific application," Sinha said. Oregon State University is also partnering with a local timber company to develop CTL's successor, dubbed Mass Plywood Panels. With maximum finished dimensions of 12 feet wide by 48 feet long by 24 inches thick, MPP can support the same amount of weight as CTL while using up to a third less wood. As Sinha concludes, "I think cross-laminated timber is just the start."